At the end of last year I worked on the cutest short film, Born Yesterday. The film is all about life, love, and what you learn when you are born and live your entire life in one day. I had the most amazing opportunity to work with Larisa Oleynik (Mad Men, 10 Things I Hate About You, etc. ), Heather Morris (Glee), Jonathan Lipnicki (Jerry Maguire), and John Weselcouch (Like Crazy). I had previously worked with most of the crew on a short earlier that year called Leader Of The Pack featuring the uber talented Steven Weber, Danny Pudi, and Rachael Harris. Being on set with everyone makes me feel like my job is not work. I hope everyone gets a chance to have a career like that. 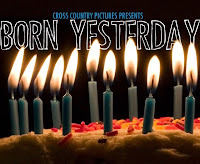 Please support and watch the trailer for Born Yesterday below!